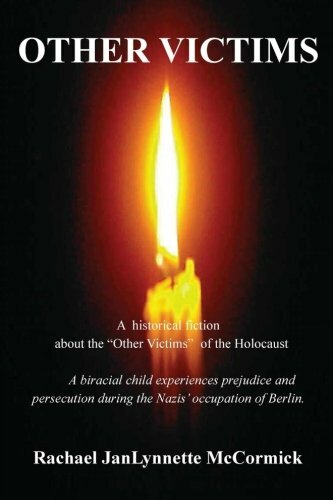 Other Victims by Rachel JanLynnette McCormick is a fictional story about the Holocaust and Rachel has very kindly prepared a character introduction for us today. So allow me to introduce Namib Mushelenga. Namib Mushelenga is the main character of my novel, with the story revolving around her and her experiences as she tries her best to live her life in the infamous Nazi Germany. Her name is short for the African country Namibia, which her black Namibian father, Omir Mushelenga, named her after. Namib’s white German mother is named Lody Mushelenga. When Hitler comes up with the devastating Death or Divorce Law, targeting interracial couples with death in a concentration camp or divorce instead, the couple and their daughter are forced to go into hiding, living in an apartment abandoned by a Jewish family. Namib is just three-years-old at the time in 1933. Now Namib is fifteen-years-old in 1944, rather small for her age and pretty thin due to stress. Because she is not an Aryan, she cannot do a lot of the many things people tend to take for granted. She can never vote, go to school, or marry an Aryan man if she wanted to. However, Namib does go to an underground school at an undisclosed location. The fact that she has to go out of her way to go to an underground school further from her home, but cannot go to the one closer to her home shows how the Nazis did not want nonAryans to be around and live productive lives. Something as simple as looking out of the window, can be life-threatening to her, for fear someone will see her and make trouble. Because she is of mixed race, Namib must deal with Aryans who don’t like her because she is half-black and then with blacks who do not like her because they feel she is half-Aryan. Understandably, she suffers a lot emotionally, being sad about her unfair circumstances. The only few things in her life that she has to make her happy are her Jewish boyfriend named Aven Beneluz, her best friend Damara Nande who is an black, African girl from Namibia, her Polish aunt named Anka von Bon that she wishes she could see more of, her God, and the hope that she and her father will soon flee from Nazi Germany and her mother, who has been growing abusive to her. Namib learns over time to try and weather the storm of her life and country. 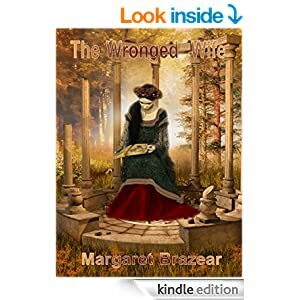 It’s another extract from author Margaret Brazear, this time from her novel The Wronged Life. He left Madeleine playing with her dog and made his way to his bedchamber where he laid down on his bed and put his hands behind his head to stare at the ceiling. His feelings were in so much turmoil, he had no idea what he should do or indeed if he should do anything. Were it not for his daughter, he might simply write to Philippa with an apology and leave it like that, but he could not do that, could he? His memory was showing him more than he wanted to see. He closed his eyes and she was in his arms, her soft breath against his neck, her soft breasts against his. She whispered his name, told him she loved him, wrapped her arms around him and her breathing came in heavy gasps as he buried himself inside her, as they rose together to such heights of passion, he thought he would explode from the pleasure. These past years he had been afraid to remember that, to recall those wonderful nights in her arms, for fear he would imagine her with Stephen, giving that same passion to him. She was a sensuous woman and if he thought at all, he thought it likely the year of abstinence had been too much for her and she had turned to Stephen to fulfil that need. What a fool he was! He stood up and went to the window which looked down on the gardens. He made up his mind as he watched Madeleine sitting on the grass, her arms wrapped around her very wet dog. He could almost smell the creature from here, but they both looked so happy. There was only one thing to do and he must do it, painful though it would be. He went downstairs and outside and walked toward her; she jumped to her feet when she saw him and he noticed her frock was soaking and trails of wet mud decorated the fabric from shoulder to knee. She was almost a woman, but he could never imagine her in voluminous skirts and heavy material, with fancy collars and delicate sleeves. Puddle raced toward him and he stepped back, out of the way; he did not want to have to change his clothes. The child’s eyes grew round as she stared at him. Her wide eyed expression of sheer wonder almost broke his heart. A child’s visit to her own mother should not be something so bizarre as to cause her disbelief. What the hell had he done? He smiled indulgently. He had no idea how the animal would cope with such a long journey, but he could hardly ask Madeleine to leave him behind, not when his intention was that she should not return to London. Still she stood and stared at him, looking concerned. “We are really going to see Mother?” She persisted and he could hear a little catch in her voice. The dog had to be lifted into the coach as the step was too high, and he was a big dog. They would have to stop for him to attend to his natural business a few times and each time it would be up to Richard and the coachman to lift him inside. It was worth it to see the sheer joy on his daughter’s face and he wondered how she had kept her counsel all these years, how she had resisted the temptation to ask him questions about her mother. He could only suppose she sensed it was not a subject he wanted to talk about and she had respected that. She was a remarkable child. Now he felt her eyes on him and he knew she was longing to question him, to find out why after all these years and all the precautions he had taken to prevent her knowing too much, suddenly he was taking her to see her mother. She said nothing but her eyes never left his, as though she was trying to anticipate his words before he spoke them. 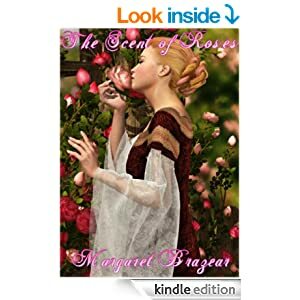 Here’s an exclusive extract from Margaret Brazear’s historical romance Scent of Roses. She was arranging some wild roses Ruby had found for her in a little vase she discovered in the pantry. Rose was with her, trying clumsily to arrange her own little vase of roses and they were lost in their own occupations and heard nothing of the approaching horse, had no idea there was anyone else in the room with them. Her first thought was that her child was in danger and she quickly scooped her up into her arms. She stepped back, away from him, her eyes wide and frightened. What was he doing back here? She thought. Someone must have given her away, someone must have seen her and reported back to him. Why else would he come when he believed them all dead of the pestilence? “You are alive?” He asked in a bewildered tone. She drew a deep breath, summoning her courage to hold on to her pride. “I am sorry to disappoint you,” she answered defiantly, wondering how she could get the servants in here, how she could call to them to take her child away to safety. She began to tremble, so much so she was afraid she might drop the little girl, making her clutch the baby tighter. Rose began to squirm, trying to loosen her mother’s grip, and Felice kissed her cheek in an attempt to soothe her. He frowned and shook his head then took three long strides to stand before her. She took another step back, then another when he kept coming, holding the child ever tighter. He stopped at last and she turned to the side, still convinced she needed to protect her little daughter, that he would steal her away as he had her son. Although her heart had leapt with fear at the sight of him, part of her was overjoyed to see he had escaped the sickness. She had not realised how much it had worried her until that moment. He had caught her this time, though. He had come before, and he must still have what he supposed was evidence of her guilt. She cursed her own complacency for believing he would not be back, not now he believed her dead. She would have to part with her child and stand trial; he was the judge and jury and he had already found her guilty. Once more she tried to think of ways to escape. Perhaps she could throw herself on his mercy after all, but to do that, he would expect a confession and she could not confess now any more than she could then. Her heart was hammering with rising panic and she choked back tears of despair. Just as she was beginning to think a life of isolation would not be so bad, just as she was beginning to rise above her feelings for Christopher, devote her love to her little girl, he had come to drag her back to the castle where all that awaited her was choking death at the end of a rope. It was so unfair! Her pride rose up once more and she felt angry, defiant. She could have explained to him how they had kept to the house, kept away from the villagers, but that would have been too simple and would not relieve her anger. He flinched at her words, as though he had been physically punched. He took another step forward and this time he reached out to her, but she held tighter to Rose and turned away from him. Relief washed over her; at least she would not be standing trial, she would not be forced to part with yet another child. “I already knew that,” she said bitterly. Felice took a deep breath to give her courage. He shook his head slowly, his face wearing a stricken look. She wanted desperately to refuse him, to say she would never live with him again, but that choice was not hers. She was still his property, and she knew him well enough to know he would take her by force. And then there was her son, who she did want to see, but was he better off without a mother now that he had grown used to it? “I have no wish to go with you, My Lord,” she answered at last. He looked around at the broken shutters, the badly patched roof where the rain and snow would pour through in the winter, where the wind would blow the fire out and leave her frozen and choking. He gave her a puzzled frown, then shook his head. Yes, she remembered clearly but it did not make him hesitate to accuse her of murder, to assure her she would hang. What good was her love, if it did not even make him stop to consider? She had loved him, she had loved him dearly; now she could not say how she felt about him.